The Apple Thunderbolt Display may just be the cleverest display ever. Macworld Lab received our new display Friday morning, and we immediately set out to test the new features. The Apple Thunderbolt Display connected to a MacBook Air. A Thunderbolt RAID array (the Promise Pegasus R6, right), and a FireWire 800 RAID array (the Promise SmartStor DS4600, left), are connected to the display. The $999 Thunderbolt Display’s specifications are impressive, but not much different from Apple’s 27-inch LED Cinema Display ( ) released last year. Both feature LED backlit displays with a resolution of 2560-by-1440 pixels, the same brightness rating of 375 cd/m2, MagSafe power connector for charging a laptop, and three USB 2.0 ports. The Thunderbolt Display has a FaceTime HD camera, while the Cinema Display has an iSight camera. The Thunderbolt Display (right foreground) has more connectivity options than the Cinema Display (left background). What’s new—and what’s really exciting—is the addition of a FireWire 800 port, a gigabit ethernet port, and (of course) a Thunderbolt port to the back of the display. You get all of these extra ports, and at the same time, you have fewer cables to string to your Mac—the Mini DisplayPort and USB 2.0 connector cables on the Cinema Display have been replaced with a single Thunderbolt connection. 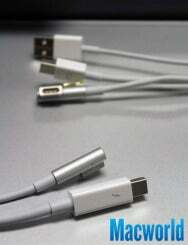 The Thunderbolt and MagSafe cables (front) from the Thunderbolt Display. In the background are the MagSafe, Mini DisplayPort, and USB connectors from the Apple 27-inch Cinema Display. If you, say, have a FireWire 800 hard drive, you can connect it to the Thunderbolt Display. That hard drive is then connected to your Mac via Thunderbolt. Ethernet and USB work in a similar way. The Thunderbolt Display, which was originally announced in July at the same time as the new MacBook Air, should be most attractive to owners of 2011 MacBook Airs, bringing some seriously fast I/O connections to Apple’s smallest laptop. Never before has the MacBook Air been able to use gigabit ethernet or FireWire 800 external devices. Before the Thunderbolt Display, connecting a MacBook Air to a wired LAN required an optional USB-to-ethernet connector, and external drives were limited to pokey USB 2.0 transfer speeds. The 2011 MacBook Air uses the Eagle Peak Thunderbolt controller, which offers two 10Gbps bidirectional Thunderbolt channels and supports one DisplayPort connection. To test the new features, we connected the MagSafe and Thunderbolt connectors from the Thunderbolt Display to a new 13-inch MacBook Air. We connected to our LAN using the display’s ethernet connector. The connection showed right up in our Network system preferences. The ethernet connection on the Thunderbolt Display appears in the Network system preference as Display Ethernet. We then connected a Promise Pegasus R6 array to the Thunderbolt port on the back of the display. The drive mounted automatically on the MacBook Air’s desktop. Next, we connected the Promise SmartStor DS4600 RAID to the FireWire 800 port on the back of the display. Again, the drive mounted on the desktop automatically. The new MacBook Pros, iMacs, and Mac minis use the Light Ridge Thunderbolt controller, which offers four bidirectional Thunderbolt channels and supports two DisplayPort connections. 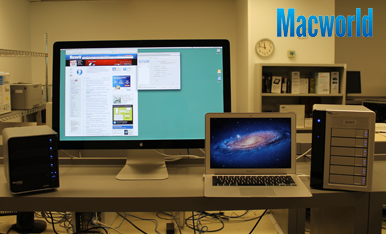 A 2011 17-inch MacBook Pro connected to the Thunderbolt Display (left). 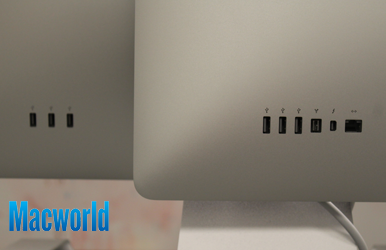 The Promise Pegasus R6 array is connected to the Thunderbolt Display, while the Cinema Display is connected to the Pegasus R6. 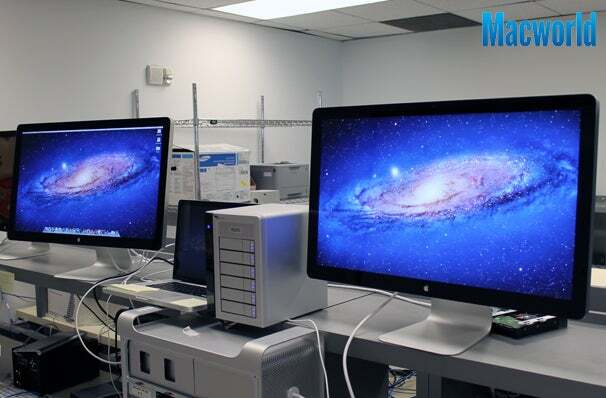 We connected the Thunderbolt Display to a 2011 17-inch MacBook Pro and were able to mount the two RAIDs, connect to the LAN through the display’s ethernet port, and connect an LED Cinema Display’s Mini DisplayPort connector to the second Thunderbolt port on the Promise Pegasus R6. The display was instantly recognized and we were able to drive two 27-inch displays along with the MacBook Pro’s built in display—that, my friends, is a lot of screen real estate. Our MacBook Pro setup, with the Thunderbolt Display (right), a Cinema Display (left), and a Promise Pegasus R6 (next to the laptop). The Thunderbolt Display requires OS X 10.6.8 or later, and a Thunderbolt-equipped Mac. The Mac Pro is the only line of Apple’s computers that has yet to be updated with Thunderbolt. Check back soon for Macworld’s complete review of the Apple Thunderbolt Display. If there are any tests you’d like to see us try, please let us know in the comments section.